Hello all, we are busy preparing for what we believe will be a busy 2012/2013 season. As we looked at our product line we realized that there was an opportunity for improvement staring us right in the face. One suggestion we hear quite often (well OK there has been some out and out whining!) is eliminating the flat bottom hopper design, so in response to that suggestion we have incorporated that feature on a new model stove. For those of you looking for a little extra heat output in your living room model stove the new Pioneer 110 should fit the bill. Aside form the bigger feeder and hopper we are also introducing a quieter gear motor and combustion fan that will also be available on the regular model Pioneers some time in the summer. 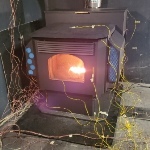 This new stove model (though not really new) is slated to go to UL testing this summer and therefore should be ready by late summer for purchase. We will be working to introduce slanted bottom hoppers for the Lil' Heater and hearth/sidewinder models as well. It is expected that these new hoppers will be available in early summer. The new larger Pioneer hopper is available immediately, contact your local dealer if you are interested (as of this release pricing is not yet determined). The prototype hopper shown here is an inch taller than the production model (which are available now for your existing pioneer), the lid will be flush with the top of the stove. As of now its on hold. Not really enough interest. Maybe next round of testing. Flyer5 wrote: As of now its on hold. Not really enough interest. Maybe next round of testing. I just don't understand why the lack of interest, this seems like the perfect stove? If I were to order a new Leisure Line, it would be this stove. Huge burner, bigger hopper that's sloped and looks great! Great stove as they all are from LL, however, to me 110K belongs in a Pocono with a bigger radiating area. Or pay the extra coin and go AK110 in the basement - bingo, now that is a stove! If space is an issue then of course see the case for a Pioneer, I to am little surprised it did not sell. coalnewbie wrote: Great stove as they all are from LL, however, to me 110K belongs in a Pocono with a bigger radiating area. Or pay the extra coin and go AK110 in the basement - bingo, now that is a stove! If space is an issue then of course see the case for a Pioneer, I to am little surprised it did not sell. Agreed , there is an optimal max burn rate for a given convection surface area to obtain the optimal heat output. That amoeba of air that gets pushed thru the stove is only in contact with the steel case for a fraction of a second. The Poke has more area than the Pioneer and thus better heat transfer. Having fins welded to the case would likely improve heat transfer and stove efficiency but it is more labor intensive and costs $. It would be pretty cool to see a video of a certification test with the burner running 90-100K without any convection fans. I can imagine some areas of the stove get a dull red with some distortion. I would think this type test is an integrity test. This would be fun. Anyone have an extra stove they want to trash ? I have one in my house. It handles it fine. The big problem is would there be enough benefit and interest to make up for the approximately $10,000 for UL testing costs? We are not completely ruling it out just we needed a break from spending money after doing the furnaces , the boilers and the powervents. We still need to put food on the table and fuel in the corporate jet.